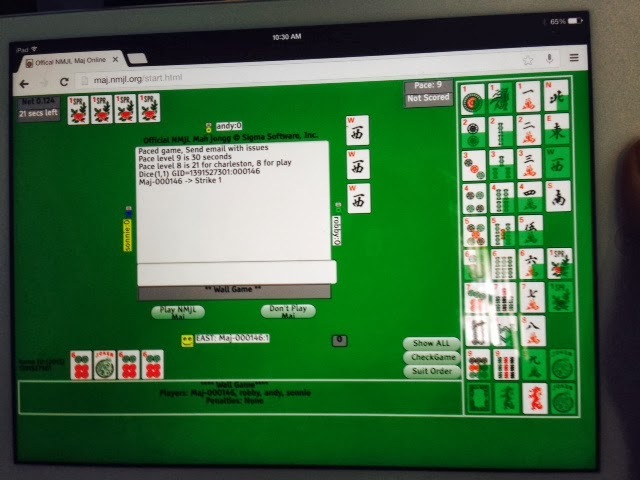 Official NMJL mahjongg on iPads and Tablets! The original online game was made for Windows computers but players have been clamoring for a way to play on other devices. Sigma Software, the official developer of the National Mahjongg League, has developed a new version of the online game which can run on PCs, MACs, iPads, Androids and other tablets. Here are the instructions for setting up the new game on your device. You MUST be a member of the League. if you are a subscriber to the original online game you already have a membership number, account number and access code. If you have bought your mahjongg card directly from the League, then you have a membership number. You will find your membership number on the mailing label of the newsletter or if you do not have a record of it you may call the League at 212-246-3052. If you are not a member of the League, you will need to purchase a card from www.nationalmahjonggleague.org. Even if you already have a card, if you buy one from the League a membership number will be generated and you will receive the yearly newsletter. Make sure to store the number where you can find it again. Once you have this number, go to the League website and click on "online game" to subscribe to the Official NMJL Online Mahjongg. The cost is $45 and a subscription purchased after January is good until NEXT March 31. When you subscribe, you will receive an account number and an access code. Keep these numbers together with your membership number. These numbers will give you access to BOTH VERSIONS of the online game. If you want to play the ORIGINAL game, you must have a PC running Windows or a MAC running a Windows emulator, such as CrossOver. Open your Windows browser, go to the League website and click on Online Game, then Download. Once you have put in your membership number, account number and access code, the game will install. To play the game, click on the Official NMJL Mahjongg icon. After you have subscribed to the online game and received your account number and access code, your next step is to make sure your device has the right kind of browser. A browser is a program or app that lets you brows the internet. Some devices already come with a browser. Apple products come with a browser called Safari, Internet Explorer comes with Windows and Silk comes on a Kindle Fire. But in order to run the online game your device must have either the Firefox or Chrome browser installed. If your device does not have Firefox or Chrome, you will have to download it as you would any other app. Firefox is preferred, but does not run on all devices. (NOTE: FIREFOX DOES NOT RUN ON AN iPAD) Chrome is made by Google and an be installed on most devices. To play the NEW ONLINE GAME you do not need to click the Download button on the NMJL site. You will only need to download and install the Firefox or Chrome browser if you do not have it already installed. The game will run on ANY device that uses one of these browsers - laptops, PCs, tablets, but NOT PHONES! To install the browser on your tablet, go to your app store or Google Play and search for the browser, then install. Both Firefox and Chrome are free. If you are using a laptop or desktop, you can download Firefox from www.mozilla.com or Chrome from www.google.com/chrome Both are reputable sites and the browsers are free. You can continue using your regular browser and only use the new one for mahjongg by saying "no" when you are prompted to make the browser your default browser. The browser will open a page that automatically sets up the new game. You will be asked to input your membership number, account number and access code. That's all there is to it! There are many new features that have been added. There are tutorials, practice play areas and fun games to help you remember hands. You can set the pace to your liking. A description of the features can be found at http//www.nmjl.org/newmaj.html As more people begin to play the new version, it will be easier to populate tables. If no one is around, play with robots! New features will be developed over time. You can bookmark the game in your browser or type maj.nmjl.org in the address bar to return. The NEW version is SEPARATE from the original Windows online game. When you play on the browser-based game you are not playing with the same people who are playing on the original game. But anyone who has the correct browser and code numbers can play the new game. Try it and let's hear some feedback. You may also send freedback directly to: mahjhelp@sigmasoftware.com Include your membership number and account number, but NEVER your access code. Hope to see you online on the iPad! My user name is Linda Fisher.